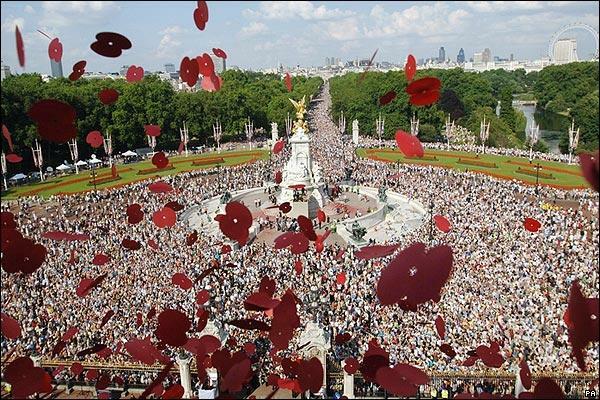 On Sunday, thousands of people gathered in London for Commemoration Day, marking 60 years since the end of WWII. 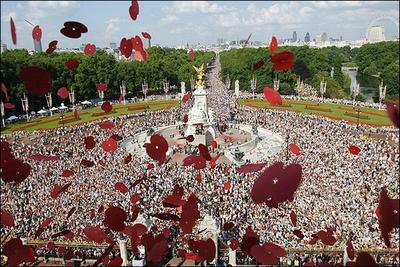 A Lancaster bomber dropped 1,000,000 poppies on the thousands gathered in the Mall. "It does not surprise me that during the present difficult days for London, people turn to the example set by that generation, of resilience, humour, sustained courage, often under conditions of great deprivation. That example, and those memories, should be kept alive by younger generations as they in turn strive to keep the peace in our troubled world." It's our job to never forget. How beautifully symbolic. I love those pictures. Aren't those stunning pictures? I sat there last night and just looked at them for ages. Aren't they awesome? 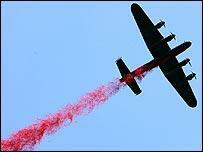 I was sad that the news website I found them on did not have a photographer's credit. I wanted to give the artist due recognition. It's fine work. they are gorgeous pics. thanks to the anonymous photog for taking them and to you for sharing them.